If you want to drive—or be driven—in the most luxurious vehicle available, then the Rolls-Royce Ghost is your only choice. For over a century, Rolls-Royce has been the first name in automotive luxury, class, and sophistication. Other vehicles may offer an impressive level of luxury, but few can match the level of refinement offered by Rolls-Royce Motor Cars. Even if they could, they would still be lacking the most distinguishing element that separates Rolls-Royce automobiles from the rest: the name. No other vehicular brand—in fact, few brands at all—can convey the sense of grandeur offered by a Rolls-Royce vehicle. Once people see the iconic Spirit of Ecstasy hood ornament, they know that they are in the presence of unmatched automotive greatness. Rent the Rolls-Royce Ghost from Premiere Exotic Car Rentals to receive an automotive experience that you won’t soon forget. The current Rolls-Royce Ghost is named in honor of the Silver Ghost, one of the most important cars ever made. It was first produced in 1907 as a replacement for a vehicle called the Rolls-Royce 30 hp. The 30 hp referred to the horsepower of the vehicle, and it was succeeded by a model called the 40/50 hp. Eventually, the decision was made that the 40/50 hp should receive all the attention of the company, and so all earlier models were scrapped. This would prove to be a wise decision. In 1907, the twelfth 40/50 hp model, with chassis number 60551 and registered as AX 201, was used as a trial model to showcase the vehicle’s reliability to the world. This vehicle was called the Silver Ghost. It was given that name because of its silver paint job and to emphasize its ghost like quietness. It was a monumental success, breaking multiple contemporary records and going on to become one of the longest running single models of all time. The Silver Ghost not only established Rolls-Royce as a maker of fine automobiles, it showed that the motorcar could be a reliable means of transportation. So much so, that it was called the best car in the world by Autocar magazine. The SIlver Ghost was so reliable that many of them still run today. The original AX 201 is now the most valuable car in the world, with its price estimated to be in the range of $12 million to $40 million. Other Silver Ghosts routinely sell for millions of dollars. The current Rolls-Royce Ghost debuted in 2009 and has followed the legacy of the Silver Ghost by going on to become one of the most acclaimed and most desired luxury cars in the world. The original Silver Ghost was one of the most advanced cars of its time and the current Ghost continues that tradition. The Ghost has a twin-turbo V12 563HP engine that surges the car from 0 to 60 MPH in a stately 4.9 seconds and is electronically limited to a maximum speed of 155 MPH. This is obviously not a vehicle made for the racetrack, but its power and speed are enough to embarrass more track-focused vehicles. The emphasis of the Ghost is on comfort and serenity, and as such, it delivers what is easily the smoothest ride you have ever experienced in an automobile. In fact, this is a luxury automobile that you will want to drive yourself almost as much as you would want to be chauffeured in it. If you are a passenger, then you will be as comfortable as the driver because the Ghost has advanced air springs that can detect the presence of a passenger and adjust the vehicle’s ride accordingly. The interior of the Ghost boasts a mix of timeless elegance and modern technology. This vehicle has a classic analog dashboard with actual dials instead of the digital displays seen in most modern luxury vehicles. However, it also has modern amenities, like a multimedia screen with satellite navigation, and a powerful stereo system. If you don’t want to worry about the modern world intruding on the sense of timelessness, then you can always cover up the screen with the touch of a button. As you would expect, all the materials used in the interior are second to none. From the natural grain leather on the seats, to the use of wood that is of the highest possible quality, to the crystal rotary knob that controls the infotainment system. No detail is too small to be overlooked. All the luxurious amenities you would expect are there as well; from seats that massage you, cool you, or warm you, to the picnic tables integrated in the seatbacks. And of course, the flourish included in every Rolls-Royce, the umbrella hidden in the rear doors. Those umbrellas, by the way, cost about $700. No expense is spared in a Rolls-Royce. Whether you are in the driver’s seat or you are a passenger, just one ride in the Rolls-Royce Ghost will show you why it is one of the finest luxury motor vehicles the world has ever seen. 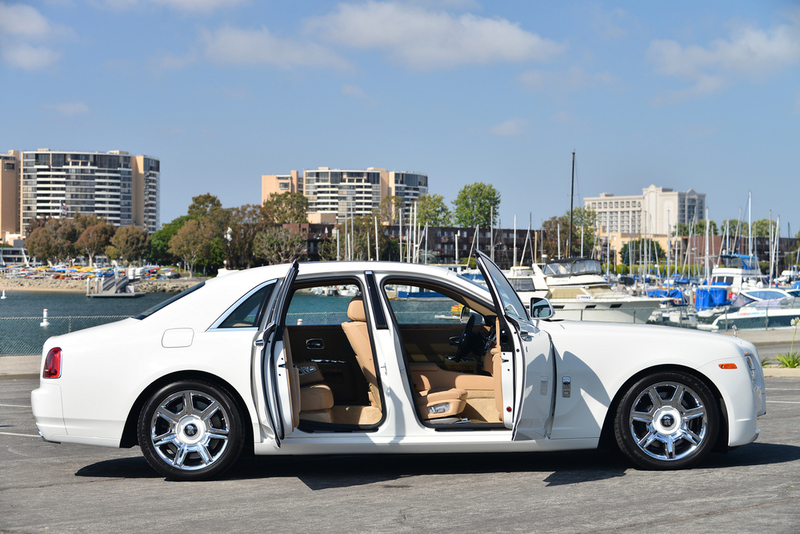 It has the details, ride quality, and luxurious accoutrements that no other vehicle can match. You would have to buy a yacht to experience anything close to what the Ghost can offer you. Come to Premiere Exotic Car Rentals to rent the Rolls-Royce Ghost and you will know why its emblem is called the Spirit of Ecstasy.